We’re so glad you chose to visit! Speed up the fun by ordering tickets online. Just bring your Paypal ticket receipt as proof of your ticket purchase to the museum admission desk, and we’ll get you right in. There’s so much to see! Valid email required to send digital tickets. Is this your first time visiting USS Kidd? Tickets are valid for any normal operating hours within 30 days of purchase. Must arrive at least 45 mins before close to be admitted. 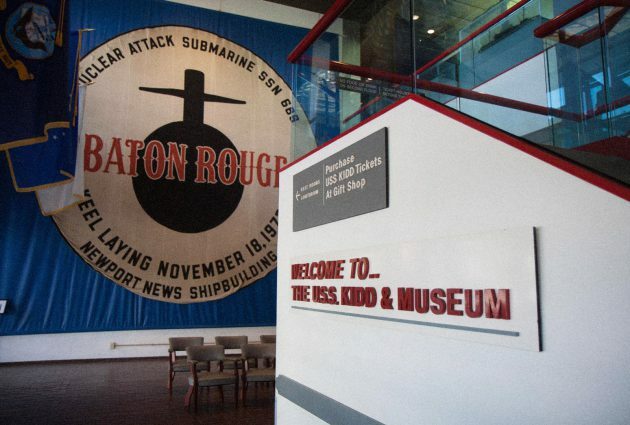 The USS Kidd Veterans Museum receives no state or federal funding. Contribute a tax deductible donation of any amount and know you are directly supporting the preservation of our military history. Check out a few of the exhibits currently open to the public. Get excited for the sights with a glimpse at our virtual ship tour. How did the Kidd get her name? Why is she docked in Baton Rouge? Find out here.